“Jersey Brothers” author Sally Mott Freeman ’76 will be the featured speaker for the Gerhard Masur Lecture presented by Sweet Briar’s Friends of the Library. She’ll speak at 6 p.m. on Friday, April 13, in the Reahard Learning Gallery at Mary Helen Cochran Library. The lecture is free and open to the public. 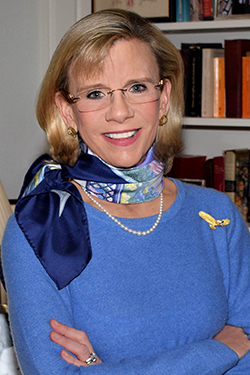 Freeman has been busy this year, following the release of her first book, “The Jersey Brothers: A Missing Naval Officer in the Pacific and His Family’s Quest to Bring Him Home.” The book is the true story of three brothers, all serving in World War II, and what happens when the youngest brother, Barton, goes missing in the Philippines. The middle brother, Bill, was Freeman’s father. The book is the result of a decade of research. Mott says she had to build a timeline, speak to dozens of people, and comb through trunks and storage boxes of information. It was time-consuming work. Last year, we asked Freeman about what the book meant to her. You can read more about the book on the Simon & Schuster website. For more information about the lecture, email LaVerne Paige at mpaige@sbc.edu.